Report update IV @ 10:00am 29/11/2018: With over 2 hours of daylight this morning without any further sighting reports, we remain optimistic that the River Liffey common dolphin has returned to open water. If you have any sightings please report them to us on www.iwdg.ie. Report update III @ 14:15 pm 28/11/2018: Last seen by IWDG marine ecologist Clowie Russell approx 13:40 outside Liberty Hall (SIPTU building), where it was heading back east before going out of sight. High tide in one hour so hopefully he/she's heading back out to sea. We'll endeavour to keep you updated here as we get updates. But no news is good news in situations like this. Report update II @ 13:25 pm 28/11/2018: IWDG Marine Ecologist, Clowie Russell reports that the dolphin is still on the George's quay at the Custom House building and swimming strongly with some head slaps and very active. It's approaching high tide shortly, which will be it's best opportunity to navigate its way back out of the river towards open sea. But we see no immediate cause for concern and are happy to let mother nature run it's course. Sometimes an "informed do nothing" is the best approach. Report update I @ 12:25 pm 28/11/2018: by IWDG Marine Ecologist, Clowie Russell who is monitoring observing the dolphin reports that it's still at the Custom House building and swimming strongly in the same area, but she doesn't think it is feeding. First thing this morning, IWDG received this really interesting video (link below) from Dublin of a dolphin, but this wasn't any run of the mill sighting, as it was swimming in Sir. John Rogersons Quay between the Sean O' Casey and Samuel Beckett bridges near Dublin City Ctr. This video was sent to us by John O' Neill of the STV Jeanie Johnston and confirms it to be a short-beaked common dolphin and suggests the animal was swimming strongly and likely to have been feeding, although what this species could be feeding on in the River Liffey is unclear. We've since received several calls from concerned members of the public asking whether anything should be done for it, and our reply is as always in these circumstances not to interfere. If this dolphin is as the video suggests in good health and was able to swim upriver towards the City Ctr., then it should be able to swim downriver on its own steam. Indeed John's last observation of it after 09:00am was that it was swimming back towards the East Link bridge. But an IWDG member at 11:15am am has just confirmed it is currently at St. Georges Quay in front of the Custom House building. IWDG marine mammal ecologist, Clowie Russell is in the area monitoring the situation and her most recent observation as of 12:25 PM is that it's still swimming strong albeit in the same area and there is nothing to suggest from it's behaviour that it is feeding. So hopefully it will make a safe return back out into Dublin Bay and the Irish Sea. On Nov. 8th a pod of c.20 common dolphins were recorded and videod by James Baxter from a commercial fishing boat off Laytown, Co. Meath area, so we know this species is currently to be seen off our east coast. 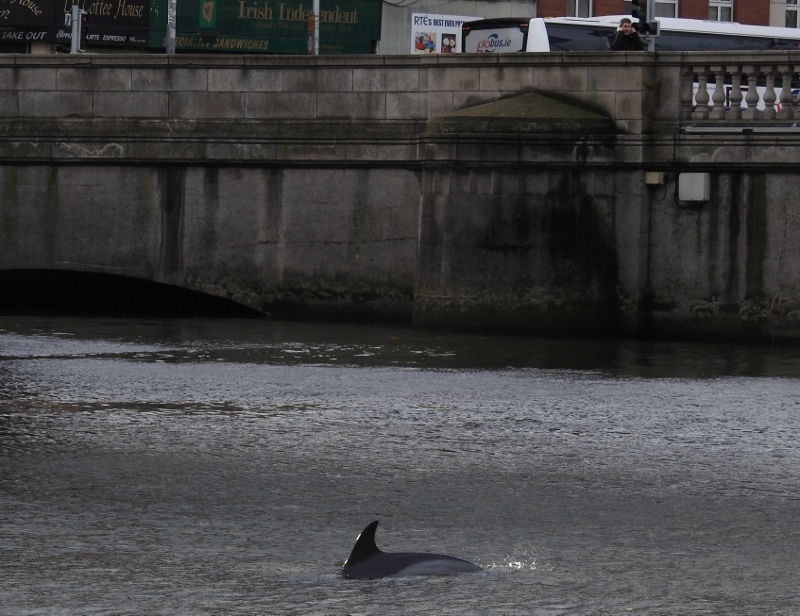 This is not the 1st incursion by small cetaceans up the River Liffey this year, as on 15th Aug. IWDG received another record of a small cetacean (species unknown) at the East Link toll bridge that was reported by Eoin Mullowney. 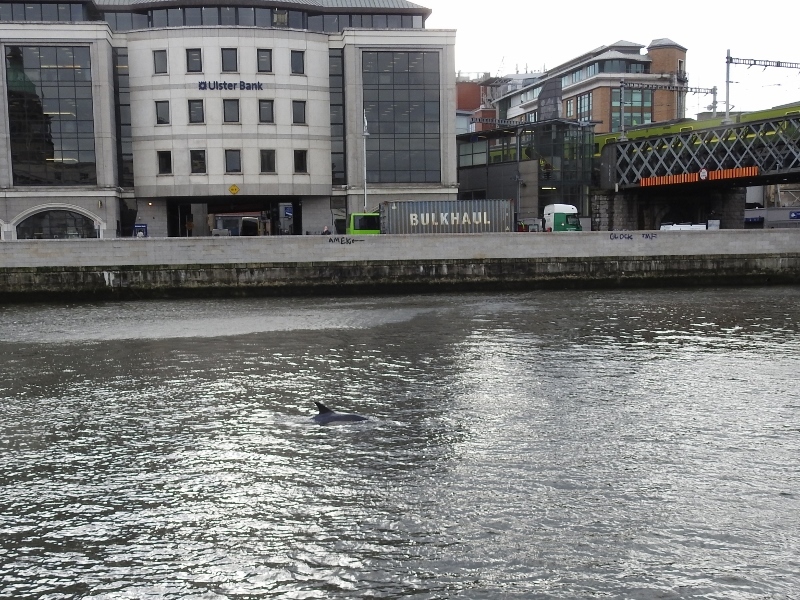 In recent years seveal species of cetaceans have been recorded near Cork city Ctr. 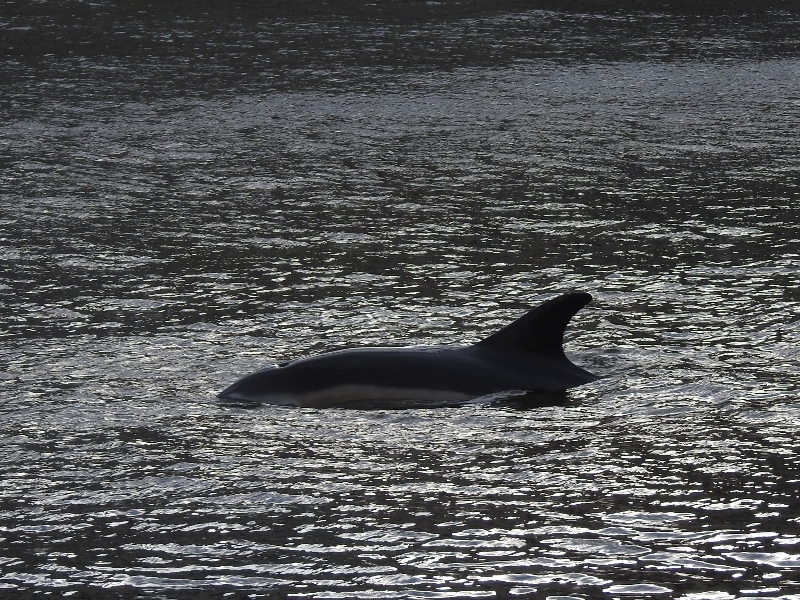 in the River Lee, which has seen similar incursions by Killer whales, Risso's dolphins, commmon dolphins, bottlenose dolphins and harbour porpoises. So from time to time even pelagic species can venture from their open water habitats into harbours and then venture into river systems. We'll keep you posted here if there are any developments on this rather unusual Dublin sighting.